1. A great personal dishonor or humiliation: Imagine the ignominy of going into the classroom in the morning without having pants on! 2. A shameful or disgraceful action, conduct, or character: After causing the accident, running away, and being caught afterwards, Ted suffered the ignominy of having to go to the police station in the police car and having to pay a huge fine. 3. 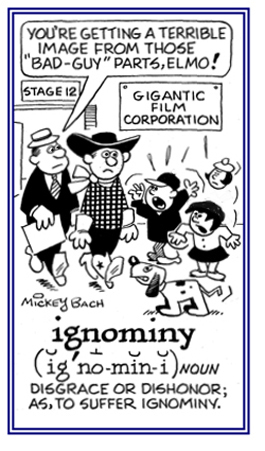 Etymology: from Latin ignominia; from French ignominie; literally, "without a name". © ALL rights are reserved. 1. Someone who has an extreme lack of knowledge: To label or to indicate that someone is an ignoramus, is saying that he or she is stupid or uneducated; however, it can also mean that a person just doesn’t know the real facts about certain things. 2. 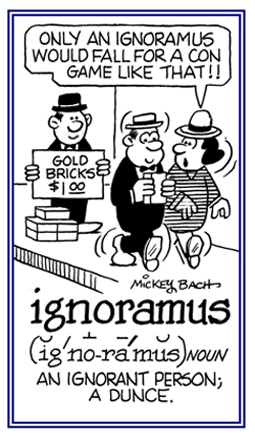 Etymology: from Latin ignorare, "not to know, to misunderstand, to disregard"; from ignarus, "not knowing, unaware"; i- (variant of in-, "not" + gnarus, "aware, acquainted with". © ALL rights are reserved. 1. A lack of knowledge, education, learning, information, etc. 2. Unawareness of something, often of something important; uninformed. There is one thing to be said about ignorance—it sure causes a lot of interesting arguments. Also given as Ignorantia iuris (juris) non excusat, "Ignorance of the law does not excuse". An even broader expression is Ignorantia non excusat, "Ignorance does not excuse"; which goes beyond the realm of law, providing us with the criticism of some unfortunate one who says, "But I didn't know . . . ."
1. Without knowledge, instruction, or information. 2. 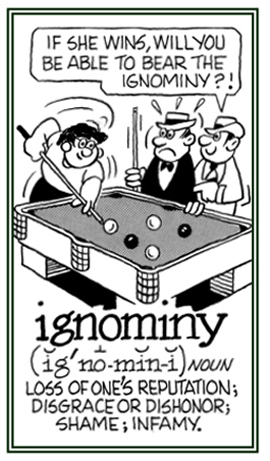 Unskillfully; inexpertly: "A man may mistake blunders as being wonderful and ignorantly admire them." To refuse to pay attention to; to disregard; refusal to recognize. 2. The diagnosis of disease by studying the antibodies in a sample of blood serum. 1. Any speech defect due to damage of the central nervous system. 2. Partial or total loss of the ability to articulate ideas or comprehend a spoken or written language, resulting from damage to the brain caused by injury or disease. 3. A defect or loss of the ability to speak or write, the loss of the ability to understand spoken or written language, due to injury or disease of the brain centers. 1. To make an incorrect diagnosis. 1. A wrong, incorrect, or mistaken identification of an illness: "Harm may result when a patient gets a misdiagnosis because he or she may get an incorrect therapeutic treatment." 2. A conclusion, identification, or decision reached by mistake: "Unless there is proper testing, the potential for a misdiagnosis can be considerable." "After several misdiagnoses, the committee found out what the problem actually was and then tehy were able to come up with a successful solution." 1. Completely lacking knowledge about a subject, several topics, or branches of learning. 2. The condition of being totally uneducated, unaware, or uninformed about something in particular, or about a multitude of things.